I could write about how excited I was that the plumbing was hooked up and I was finally going to have a toilet. I could write about how dissapointed I was when the water valve turned out to be buried six feet under frozen ground. I could write about how upset I was when they dug out the valve and turned it on and water began to gush out. I could write about how we had to abandon the original water line and reroute a new one. I could write about how they cut the fiber optic line to the internet and phone while trying to fix the Hub's water tank. But I won't write about any of those things. They are simply to depressing. I will show you this. 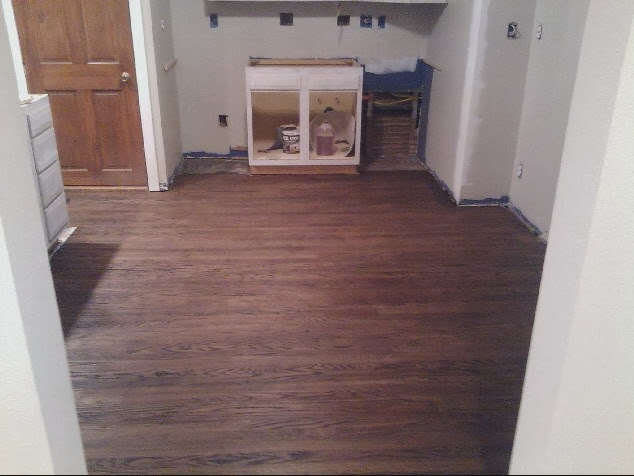 I finished staining all the old house floors last night! I could tell you how I drove all around town today trying to find 'lambs wool' or a 'synthetic pad applicator' that the directions on the polyurethane label call for. I could tell you how none of the four, FOUR, hardware stores in town sell either of those supplies. I could tell you how I gave up and finally just started snot crying. But I won't because that is just lame. I will tell you that the stain looks amazing and tomorrow morning I will get up very, very, early to apply the first coat of poly to the floors using a large bristle brush. I hope to tell you wonderful things tomorrow, but after today I am not going to promise anything! Have you ever applied polyurethane to wood floors yourself? Any advice?